(Nanowerk News) Thanks to their unique properties, ionic liquids are all in the rage as solvents as "green" sustainable chemical processes. Recently, two research teams at Umeå University in Sweden discovered how enzymes can perform their catalytical processes in a switchable ionic liquid. The discovery paves way for enzymatic refinement of cellulose to precious molecules and industrial products. The results have been published in the journal ChemSusChem ("Realtime 31P NMR Investigation on the Catalytic Behavior of the Enzyme Adenylate kinase in the Matrix of a Switchable Ionic Liquid"). Ionic liquids are salts in fluid form at room temperature – compared with regular cooking salt, sodium chloride, which melts at 800 degrees Celsius. This characteristic means that ionic liquids have unique properties making them important solvents for “green” and sustainable chemistry. 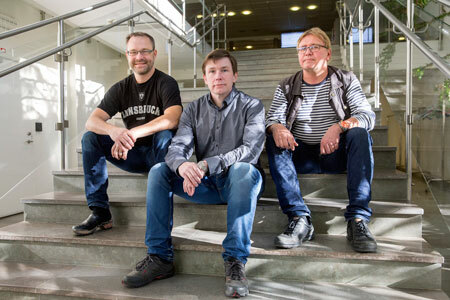 In a previous study, the professor in chemistry Jyri-Pekka Mikkolas’ research group has discovered that hemicellulose, cellulose and lignin can be selectively separated and dissolved using a new type of so-called switchable ionic liquid. Recently, a team of Magnus Wolf-Watz and Jyri-Pekka Mikkolas research teams have discovered that enzymes can function in this particular ionic liquid. This is far from evident since enzymes have evolved into functioning in water solutions. From left: Magnus Wolf-Watz, Per Rogne and Jyri-Pekka Mikkola. “Our discovery is a scientific breakthrough! This is the launch that enables us to extract small key molecules directly from wood. There are many applications not in the least in the production of ethanol as fuel but also a number of other things,” says Magnus Wolf-Watz, associate professor at the Department of Chemistry. The main experimental technology used is NMR, nuclear magnetic resonance spectroscopy. A crucial component in the work has been the development of a completely new method to determine the enzymatic activity. The assay procedure is based on real time measurements of the chemical reaction using 31P NMR spectroscopy. The NMR infrastructure at Umeå University is at international top class and are funded by the Kempe and Wallenberg Foundations. “This development will be of major importance to the measurement of enzymatic catalysis in complex solutions and preparations, and the method is already being used in new projects,” says Jyri-Pekka Mikkola, professor at the Department of Chemistry. The research team is represented by researchers from both biochemistry and technical chemistry. Jyri-Pekka Mikkolas’ research team is a part of Bio4Energy’s research environment that aims to take Swedish biorefinery research to whole new levels. Jyri-Pekka Mikkolas’ research team also belongs to the network Wallenberg Wood Science Center.